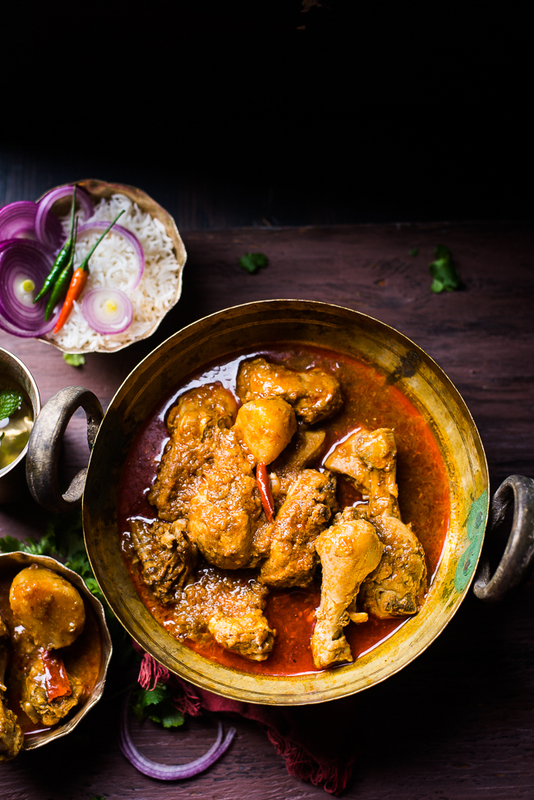 Murgir jhol, a thin curry based chicken dish that is very common in Bengali households. 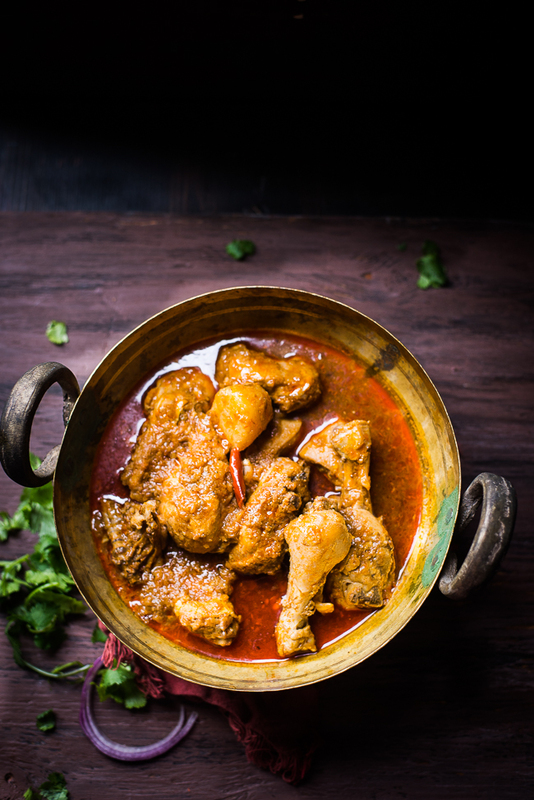 This Bengali style basic Chicken curry has another name too, Sunday Chicken Curry. Because most of the time this is cooked and enjoyed during Sunday afternoon meals. When we grew up, used to have chicken mostly on Sundays, the only holiday of the week and so naturally, it was something very special. 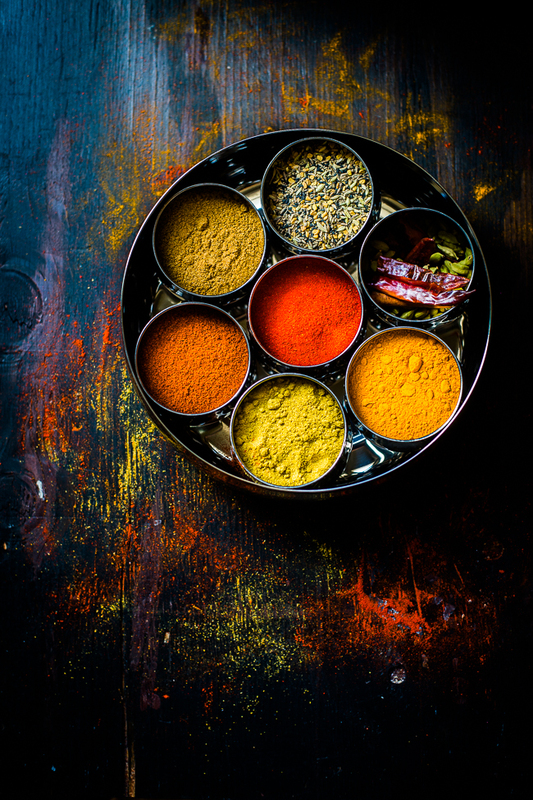 This is just an Indian Spice Box, I am not using Panchphoron here. 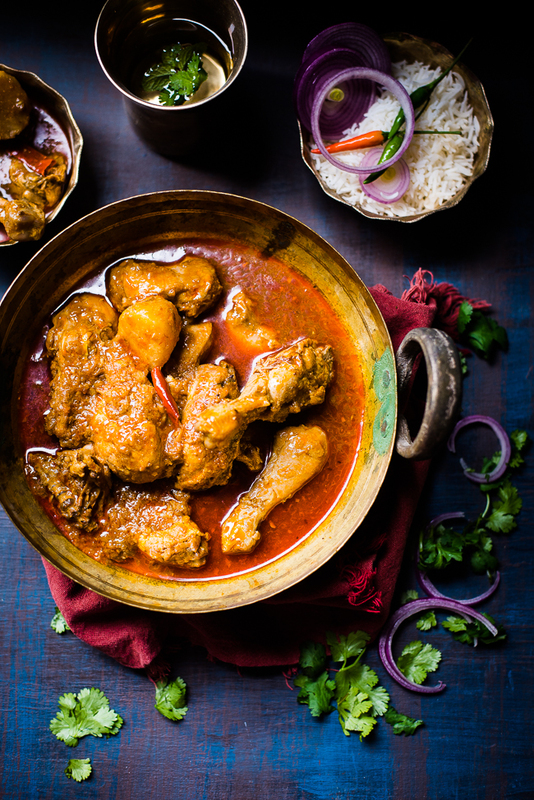 There is actually no documented recipe to make this chicken curry. It is versatile and you can customize it if you want. Generally, this Murgir Jhol is always characterized by its spicy red color and the presence of large sized pieces of potato. This is my attempt to recreate the Sunday chicken Curry from back home. 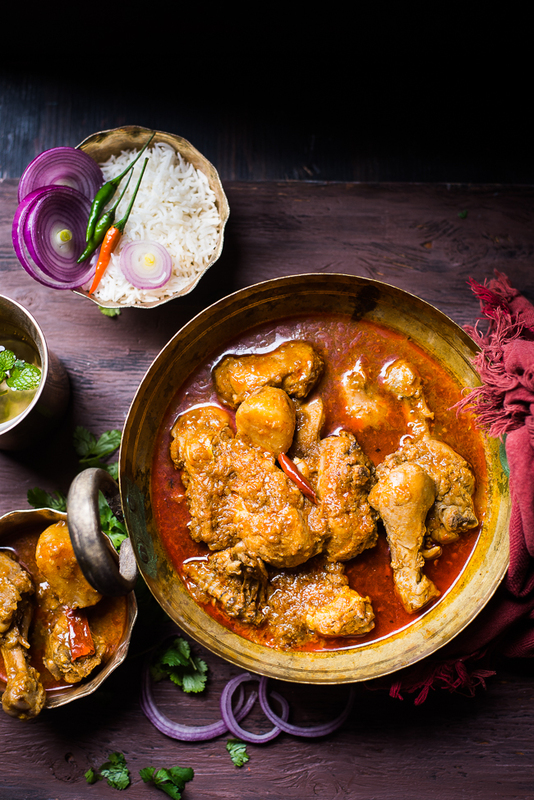 This soupy Chicken Curry goes best with hot steamed rice. 1. Marinate the chicken pieces with lime juice and salt. Let it rest for about 15 minutes. Add oil in a wok and heat it up. Once the oil is hot add the potato pieces and fry them till they are golden brown. Remove it from pan and keep it aside. 2. In the remaining oil, add the sugar and caramelize it on medium to low heat. Sugar will slowly melt down to golden brown in color. Add the whole green cardamoms, cardamoms, cinnamon stick, cloves. 3. When they are aromatic, add the chopped onion, cook the onion, once they start browning, sprinkle some salt. 4. Add the garlic paste and ginger paste, cook them along with onion, until the raw smell goes off. 5. Add turmeric, cumin powder, coriander powder, red chili powder, Kashmiri red chili powder and stir it. If you are using tomato, add it now. 6. Once the masala leaves oil, add marinated chicken pieces and stir it well. Brown the chicken on low heat. This is the time taking part, takes 10 to 15 minutes. Stir it, cover with the lid and let it cook. Once the chicken is almost 80 % cooked, oil starts separating from all the sides, add 3 cups of warm water. 7. Add potato pieces. Mix thoroughly, check seasoning and cover it. Let it simmer till the chicken and potato pieces are fully cooked. Add the garam masala. Sunday Lunch is ready! Serve hot with a bowl of steamed rice and salad.